non- traditional compared to the all church or hotel ceremony locals . They are more about the sun, sand, sea, and the fun that comes along with an outside in nature ceremony. Other than all that, the real enjoyment is in getting ready for the occasion. There is so much to plan for, especially for the bride, from what she is going to wear to what the theme of the occasion . So, what is the most essential item for a bride? well maybe the guy / groom ? No it’s the Wedding dress !! It is the most important item in a bride’s checklist (number 1) and she needs to get it right, before the big day arrives. 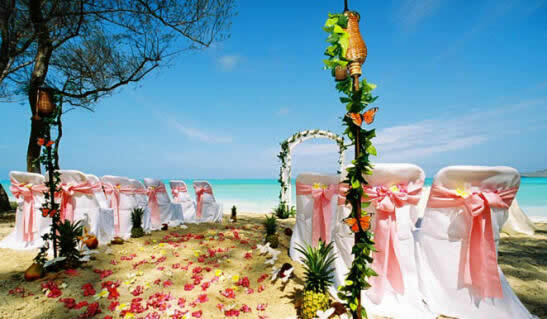 Also, if she is planning to host her wedding at a destination like a beach there are several considerations to make. Also, since winter is here, your wedding dress must be designed to meet, well, everything. So, here are some beach styles for a winter wedding of your dreams. Let’s take a sneak-peek. After all, just because it’s the beach you do not have to keep your options limited. Try on a tea-length dress if you are particular about not getting the sand stuck to your dress, or having your hem ruined. To match up your hair to the occasion you can get the loose curls with a flower crown or you can just work up a simple bun with flower embellishments. If you want to go traditional during the ceremony and dance ready for the after party then you can opt for the two-piece wedding dress, with a detachable skirt. Just pin up the skirt over your mini dress when taking the vows and when you want to get comfortable and ready to dance with your friends in the evening, unpin the skirt and get ready for some fun. Another idea to suit the weather and the ambiance is the boho-styled dress. The dress brings out the best of a bride’s beauty on the sunny beach, with the fabric flowing freely in the air. Brides can pair this with embellished stone anklets to complete the look. So remember in all the tropical island winter is the same as summer and its sunny most year round so plan your dress accordingly. The beautiful strapless flowing wedding dress is perfect for flaunting your style on your wedding at the beach. In case it gets chilly towards the evening, you can always cover up with a fleece shawl embedded in crystals. Beach style weddings can be amazingly romantic, easy and breezy for choosing your wedding dress , especially if everything has been prepared to suit the occasion . There are unlimited options of wedding dresses to choose for a beach wedding. All you need to do is see which one fits your personality and theme best.